To observe that the Biograph shorts of D. W. Griffith are among the most important films ever made is nothing new. These works, and the great features to which they lead, are familiar staples of historical surveys – their development (if not invention) of parallel editing, of composition, of the dialectic of types of shot (close-up vs. medium shot), of film acting, have been remarked upon repeatedly, sometimes very perceptively. (1) Why, then, offer an analysis of A Corner in Wheat (1909), one of the most famous of Griffith’s shorts? What need be said about this film now? There are, I think, several related justifications. One is purely personal: although I had seen many of Griffith’s films over the last ten years, I only recently saw A Corner in Wheat, was extremely impressed, and wanted to understand why. Another is that art must be perpetually rediscovered, especially in a time as accelerated and inattentive as ours. What T. S. Eliot stated in the 1930s is even more urgent now: “Our effort is not only to explore the frontiers of the spirit, but as much to regain, under very different conditions, what was known to men writing at remote times and in alien languages.” (2) One of those remote times is ninety years ago-nearly unimaginable in the aggressive present we inhabit; and one of those languages is Griffith’s cinema, in some ways so familiar to us as a basic grammar and vocabulary of our mediated experience, but also separated from us, not least by its integrity, and by our desensitization. There is much in A Corner in Wheat that has not been exhausted, that remains thematically and formally fresh, even necessary. And yet most people are ignorant of such riches, including those students and scholars for whom these works seem to be dioramas of antiquated techniques, not living experiences. I hope to articulate some of what is alive in this great film, both intrinsically and in its relation with later work, especially that of Jean-Marie Straub and Danièle Huillet. A Corner in Wheat is a little meditation on capitalism, derived from Frank Norris, weaving together narrative fragments linked by their relation to wheat. The film begins with farmers sowing grain and taking their meager harvest to market. Capitalist speculators engineer the “corner in wheat” of the title, establishing full control over the world’s supply. We see, intercut with this coup and the main capitalist’s ensuing celebrations, the effects on others: another speculator is ruined, the farmers return home empty-handed, the urban poor go hungry and begin to riot when bread becomes unaffordable. The riot is squelched, but the “Wheat King” meets with his just desserts, inadvertently buried under an avalanche of grain, while the farmers continue to toil. There are, then, three narrative strands. The farmers sow their seed, go to market, return empty-handed, and toil more. The capitalist engineers his plot, succeeds, ignores the defeated man’s plea, celebrates, and dies at the site of his wealth. The urban poor go hungry, riot, and are defeated. No character from one strand enters another, nor are any locations held in common among them. All that links them is wheat-that and the force of Griffith’s juxtaposition and commentary. Gilles Deleuze’s statement, derived from Eisenstein, that in Griffith the rich and the poor are “treated as ‘two parallel independent phenomena,’ as pure effects that are observed . without having any cause assigned to them” (3) is not true of A Corner in Wheat. Griffith’s structure directly analyzes the connection, and alienation, of rich and poor, and holds the actions of the former responsible, at least in part, for the situation of the latter. What is remarkable is how Griffith does not merely assert his message, but achieves it formally. Griffith structures A Corner in Wheat through juxtaposition of images (editing) and commentary (intertitles). (I have included, as an appendix, a shot by shot breakdown of the film for convenient reference.) The film’s editing has elicited a great deal of analysis. As Tom Gunning has written, parallel editing is here not in the service of suspense, interweaving “converging lines of action” and describing “the same temporal trajectory”, instead, it “stresses comparisons and relations.” (4) Usually Griffith uses parallel editing for the former: the intercutting of the besieged family and the rescuing father in The Lonely Villa (1909) and the more elaborate siege and rescue in The Birth of the Nation (1915) are the classic examples. Here, however, Griffith is after something less visceral but more profound, the creation not of sensation but of meaning: the audience realizes the film’s implicit moral argument by assessing the relationship of adjacent, contrasting shots. In other words, as Vlada Petric has pointed out, it “anticipates Eisenstein’s intellectual montage.” (5) Further, the editing, as Gunning writes, has special appropriateness in this film, as it represents the “new topography” of modern capitalist economics, and its “lack of face-to-face encounters with the forces which determine our lives.” (6) The best example of this is the sequence depicting the Wheat King’s celebratory banquet, in which his luxurious consumption is set against the impoverishment of the farmers and the urban poor (shots 9 though 18). The contrast between plenty and need is immediately clear; yet Griffith somehow avoids belaboring the obvious, the overt manipulation which makes Eisenstein’s adaptation of the same technique in October (1928) so distasteful. Perhaps this is because Griffith lets the intercut strands follow independent narrative logics, rather than subordinating one as a mere symbolic commentary on another; and because of the tact of Griffith’s long shots. Although other Griffith films will surpass A Corner in Wheat for excitement, none will improve on its capacity to advance an argument, to present ideas as well as feelings. Only in Intolerance (1916) will Griffith attempt fully to integrate such “intellectual montage” with the more sensational editing of his rescue sequences: his aim there is to provoke in the audience both a comparative interpretation of different epochs as well as the excitement of their rhythmic convergence. Grand and profound as Intolerance is, the effect there is not wholly under control (the Huguenot story is not equal to the modern or Babylonian stories, some of the transitions seem arbitrary). A Corner in Wheat lacks Intolerance‘s range; but everything in it functions with great focus and efficiency. Many have commented on the editing in A Corner in Wheat. However, I have not seen much discussion of its titles, which are also of great importance: they are often ironically dissonant with the image that they accompany, and underscore the alienation of capitalism from the actual conditions of life from which it profits. Of the film’s 32 shots (not counting the opening title), 8 are texts-7 titles, and 1 telegram; and most of these are early in the film, articulating its structure. Shots 3, 5, 7, 9, and 11 are all titles introducing images, and three of these titles relate to their accompanying image with overt irony, establishing a discrepancy between expectation and fulfillment that will resonate throughout the film. The first title merely introduces the Wheat King; but the next, shot 5, reads “The Final Threshing.” What is depicted, however, is not the threshing of wheat, but the activity in stock market: the title generates a literal expectation that instead resolves as a metaphor for the market’s energy and ruthlessness. Similarly, shot 9-“The Gold of the Wheat”-and shot 11-“The Chaff of the Wheat”-also do not depict the wheat itself, but set up the contrast between the luxurious rich and the urban poor. Again the wheat in the titles is not literal but metaphorical, and suggests how the wheat’s significance in the capitalist economy becomes generalized, to the extent that human beings are functions of the abstract economy of wheat, not the wheat in the service of human beings. After establishing these sites and associations, Griffith turns away from titles to develop the narrative within the independent strands: the contrast between the celebration of the Wheat King and the misery of the poor does not require further commentary. Especially striking in this sequence is shot 14, which is a static tableau of a bread line. It is not a freeze frame: rather, the actors stand motionless, a jarringly non-naturalistic effect that presents the image as a symbolic summation of the poor’s condition. After cutting back to the King’s banquet, Griffith supplements this image of urban misery with the misery of the returning farmers as well. Now Griffith reintroduces titles, as shots 17 and 19. The first one is baldly descriptive: “The High Price Cuts Down the Bread Fund.” Shot 18 repeats shot 14: now, however, the shot is set in motion, as though the descriptive title has detached the image from its symbolic space and returned it to reality. The second title brings back the metaphorical strain of the earlier titles, but now combines it with literal meaning as well. “A Visit to the Elevators” suggests exactly what we are about to see: a tour of the grain silo to view the source of wealth. However, Griffith precedes this literal fulfillment of the title with a shot in which the Wheat King’s wife (?) and friends visit the King’s office and suggest the tour. This intervening shot suggests a metaphorical reading of the title: the capitalists are also “elevators,” that is, people who have inflated (elevated) prices for their gain. This double meaning triggers the film’s denouement: it is as though the estranged metaphorical reading now matches the literal one, and the alienation between them, felt so poignantly early in the film, can be resolved. This resolution is the death of the Wheat King, in which the substance whose abstraction as market value (emphasized by one other title-the telegram informing him of his cornering the market in shot 24) kills him in all its hitherto ignored palpability. Griffith’s intelligent cultivation and deferment of expectations through titles has built much of the resonance for this peripeteia by amplifying both the metaphorical and the mutual significance of what we have seen. The titles are not merely labels but another strand in the film’s complex polyphony. One source of interest of A Corner in Wheat is its use by later filmmakers. I have mentioned Eisenstein’s extension of Griffith’s principles of thematic montage; but there are other successors. Not only the theme of capitalist excesses, but the very appearance of the capitalists and the chaos of the stock market recur, for example, in Fritz Lang’s Dr. Mabuse der Spieler (1922). Lang’s scene is structured very differently, around dynamic editing that has its roots in later Griffith; whereas Griffith’s is a single static shot. 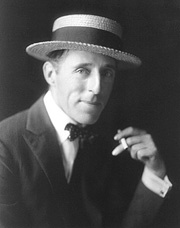 However, both directors vividly convey the market’s confusion-Lang by subjecting us to its accelerating rhythm, its sudden wrenching reversals, Griffith by filling the image with more than the eye can comfortably take in: there is so much to see that one may initially miss the entry and decisive presence of the Wheat King, or the fainting man who will later beg for the King’s mercy, or the man who underlines the arbitrariness of the market with a coin toss to determine who bids. The formal choices of both Lang and Griffith reflect different stages of film technique, but are equal in power and critical incisiveness. The Wheat King’s death in the avalanche of wheat is also the model for the end of Carl Dreyer’s Vampyr (1932), in which the evil doctor suffocates in a torrent of flour. The similarity of situation only underlines the differences: Griffith’s effect is a necessary one, absolutely justified thematically; whereas Dreyer’s effect is shockingly incongruous: its poetic justice operates on a metaphorical level (pure white nutriment vanquishes vicious parasite) that is both richer and less precise than Griffith’s. Most interesting, however, and indicative of what I find most alive in this film, are Griffith’s anticipations of the work of Jean-Marie Straub and Danièle Huillet. (Straub and Huillet are on record as admiring the film: they requested, for example, that it be one of the movies by other filmmakers shown at their New York retrospective in 1982. (7)). Griffith’s film is characterized by a striking use of different spaces, natural and artificial; types of action-literal (as in shot 2-see below), “acted,” and static-symbolic; and levels of action linked only by thematic relevance, not by actual contact. This variety opens a remarkable structural flexibility, in which narrative is in the service of intelligence, not the opposite. As such, it is the direct precursor of The Bridegroom, the Comedienne, and the Pimp (1968), which differs from Griffith only in its more oblique principles of association among its elements, and in its greater and more systematic heterogeneity. Straub and Huillet juxtapose a documentary shot of prostitutes on a Munich street with a condensed stage play about exploitation and betrayal, and follows these with a stylized narrative of a prostitute’s marriage and liberation from her pimp. These separate meditations on prostitution and society are not intercut, as in Griffith, but simply paratactic; but in both, the juxtaposition of different views of the same subject, treated in different styles, allows the audience to interpret the work’s meaning actively. Just as Griffith sets the real space of the farm against the shallow sets of the other scenes, so Straub and Huillet intensify such dichotomy into dialectic by confronting street documentary with filmed theater. Similarly, Griffith’s static tableau calls attention to its artificiality as a way of impressing its symbolic value, much as the end of Straub and Huillet’s film foregrounds its implausibility to suggest a different and more active symbolism. (8) One might even compare Griffith’s use of titles to articulate the film’s meaning with the partially illegible Mao quote that serves as a backdrop to Straub and Huillet’s stage play, which also holds the action at a critical distance and foregrounds the audience’s act of interpretation. Another direct anticipation of Straub and Huillet is in Griffith’s image (Shot 2) of the farmers and horses in the field, sowing and plowing. It is a daring image, lasting over a minute, confronting the viewer with the real time of the action-a perfect example of Bazinian morality. Griffith does not merely depict, and subject us to, the tedium of labor, but transfigures it into a revelation of space: the farmers and horses move toward the camera from extreme long shot through medium to medium close and then out of the frame, past the camera on our left. Then they return back into deep space, while the horses, which have been following them, continue to advance toward us before turning back themselves. Not only does Griffith break with the proscenium as fully as possible and reveal the whole range of space as the cinema’s domain, but he creates, in the counterpoint of advance and retreat, and in the suspense of distance and nearness (as in the Arrival of a Train  of the Lumières), just enough spatial complexity to captivate attention, make it alert. The effect is very near an extraordinary shot in Straub and Huillet’s Too Early, Too Late (1981), in which Egyptian farmers approach the camera from a great distance and pass by. This shot is a space in which “the people,” about whom the narration is concerned but who are usually absent from or incidental to the visible landscapes, come into view; and it is also a moment of considerable suspense-will the image cut away before the people reach us? how long will they take? This suspense is based not on trickery but on patience, and on curiosity about how perception measures space and time. Griffith stands directly behind this attentiveness. In any case, both Griffith and Straub and Huillet avoid sterility in their appetite for a dialectic between reality-the indexical nature of the image-and formalism-the image’s stylization and tendency to abstraction. (9) Paradoxically, in their work obtrusive form may let reality speak for itself. Further, the “primitive” restriction of means-a function of technical development in Griffith’s cinema, a voluntary choice for Straub and Huillet-becomes not poverty but wealth: what few choices are available are made to concentrate as much meaning as possible. The absence of a moving camera for Griffith, for instance, means that shots must be designed for maximum efficiency, and accounts for both the generous density of the images and the precision of the compositions. I have already cited Shot 2, but will again emphasize how captivating is its counterpoint of action in real time: it both captures the hopelessness and monotony of the farmers’ condition and transcends it by awakening us to the beauty and intricacy of the real. A last and crucial kinship between A Corner in Wheat and the work of Straub and Huillet is in the use, and function, of structural dissonance. The death of the Wheat King rhymes with the mob’s raid on the bread shop: they are directly juxtaposed, and both are turning points in their respective strands. But Griffith frustrates the analogy: while poetic justice destroys Hammond, the mob’s attempt to get something to eat is thwarted by the police; and their defeat is echoed in the last shot (32) of the sower, now alone, bereft of companions and horses. The death of the Wheat King may be deserved, but is not sufficient to right the wrongs that he and the system he represents have caused: misery continues, the social order remains unimproved. In fact, Griffith underlines the sower’s desolation: he is wearier, more isolated, worse off than in shot 2. Barton Byg, writing of Straub and Huillet’s Introduction to Schoenberg’s Accompaniment to a Cinematographic Scene (1972), observes, “There is no ‘resolution’ in their work . but [it] implies a resolution outside the work itself.. [The] subject of this ‘resolution’ is outside the work of art but implied by it-is its utopian aspect.” (10) This is precisely true of Griffith’s film as well: Griffith’s unfulfilled parallelism, his deliberate frustration of the mutual determination implicit in his cross-cutting, posits the answer to the social dilemma that he depicts outside of the film, in society itself. Formal openness and political meaning become one and the same. One thinks of Straub’s comment about the corruption represented in Machorka-Muff (1962), his similarly inconclusive first film: “The avenger is in the audience.” (11) In Griffith, as in Straub and Huillet, form has social implications and consequences; and Griffith’s question, and rebuke, to society remains, thanks to formal daring and to capitalism’s continuing callousness, as much a challenge now as almost a century ago. After the opening title, A Corner in Wheat consists of 32 shots. The action transpires in several locations: a real farm and several sets representing the office of the “Wheat King,” a bread shop, a banquet hall, and a grain elevator. 1. A farmer slowly and repeatedly sifts grain with his hands, talking with his wife. He picks up the bag of grain, leaves with an older farmer, while wife and daughter look on. 2. The two farmers casting grain, in extreme long shot, followed by another farmer with their work horses. They move into the foreground and off screen, and then return into extreme long shot; the horse follows. 4. An interior: the Wheat King instructing his cohorts in their office. He stands, making a gesture of resolve; the others leave to do his bidding. 6. The stock market, dense with people speculating. The Wheat King enters and leaves; a man faints, ruined by the bidding. 8. The Wheat King’s headquarters. Their mutual congratulations are interrupted by the ruined man, who is summarily and uncharitably dismissed. 10. A sumptuous banquet: the King enters, offers a bold toast to general acclaim. 13. The King’s banquet: he smokes a cigar. 14. The bread shop: a static tableau of an impoverished bread line. 15. The banquet: the King nods in response to several women’s comments. 16. The farm. The woman and child point off screen left; the farmers return, empty-handed and despondent. 18. The static tableau in 14 recurs, and is set in motion: the poor approach the proprietor for their welfare bread, but only the first four or five receive it: the others are turned away. 20. The office: the wealthy women enter to visit the King and his colleagues; they consult and leave together. 21. A grain elevator. One worker on screen, another enters with the guests. 22. The floor of the elevator: grain pours in from off screen upper right. 23. The women look into the grain pit; a worker brings the Wheat King a telegram. 25. The King makes a gesture of triumph, loses balance, and topples into the pit. 26. Within the pit: the King lands, grain pours onto him. 27. A policeman at the bread shop talks with the nervous proprietor. Many poor enter, rioting: the policeman and another hold them back, with clubs and guns drawn. 28. The King’s hand is buried in wheat. 29. A worker leads the King’s friends back into frame, and they leave. 30. In the office, the women and the King’s colleagues notice his absence- alarmed they go out. 31. They enter the grain elevator, as the King’s corpse is dragged by a rope out of the pit; a woman (his wife?) mourns. 32. The farm. As in shot 2, but now only one solitary man wearily casts grain from long shot to relative nearness, then turns back. Fade out. Only after writing the bulk of this essay did I encounter two valuable analyses of A Corner in Wheat: Tom Gunning’s chapter in Paolo Cherchi Usai, ed., The Griffith Project, Volume 3 (London: British Film Institute, 1999), pp. 130-41; and Helmut Färber, A Corner in Wheat von D. W. Griffith 1909: Eine Kritik (München-Paris: Helmut Färber, 1992). Gunning’s discussion of the film’s sources and editing and Färber’s commentaries and shot analysis are very useful and thorough scholarship; however, I altered little in my more amateur text after consulting them, with a couple of obvious exceptions. I wish I had had access to Vlada Petric’s monograph on the film, since her essay on Griffith in Richard Roud, ed., Cinema: A Critical Dictionary (London: Secker and Warburg, 1980), pp. 449-62, has been of considerable use to me in thinking about Griffith. Quoted in Hugh Kenner, The Invisible Poet: T. S. Eliot. New York: Harcourt Brace, 1959, p. 341. Gilles Deleuze, Cinema 1-The Movement Image, translated by Hugh Tomlinson and Barbara Habberjam. Minneapolis: University of Minnesota, 1997, p. 149. Gunning in Usai, p. 135. Petric in Roud, p. 458. For the full list, see Barton Byg, Landscapes of Resistance: The German Films of Danièle Huillet and Jean-Marie Straub. Berkeley: University of California, 1995, p. 20. See Gilberto Perez’ lovely account of the film’s ending in The Material Ghost. Baltimore: Johns Hopkins, 1998, pp. 321-3. See Perez again for a discussion of “index” and “icon,” pp. 32-4.